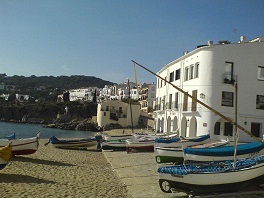 One of the Costa Brava's most typical villages, Calella de Palafrugell, can be reached by following the coast northwards from Palamos and Cala Castell. Some Iberian ruins, Cap Roig and Cala Golfet, contribute greatly to the spectacular scenery of this part of the coast - scenery that can be seen at its most splendid in Calella de Palafrugell and the countryside surrounding it. The village itself grew out of the two groups of dwellings of Canyars and El Canadell, each of which has its own nice beach. As the original appearance of these old houses has been retained and new buildings and hotels have carefully imitated their style, today the village is marvelously attractive and colorful. 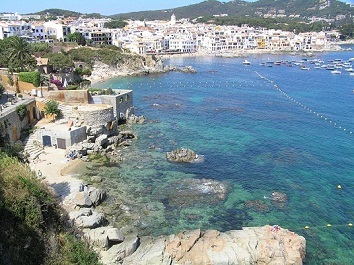 Calella de Palafrugell, which comes under the administration of Palafrugell, is about three kilometers away from this important and sizeable city. It is the centre of the cork industry (bottle-corks, cap-lining, etc.) and today a privileged spot for the tourist traffic of the Baix Emporda (also called Empordanet) region.